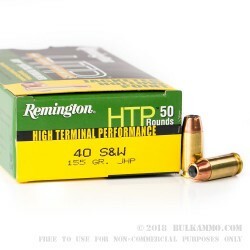 Remington’s High Terminal Performance .40 S&W ammunition is an American-made hollow point that delivers excellent performance as a self-defense round. 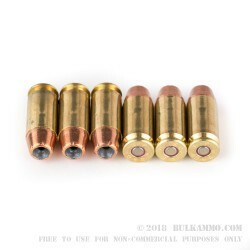 These .40 S&W rounds are loaded with a 155-grain jacketed hollow point projectile, in boxer-primed, noncorrosive, reloadable brass cases. 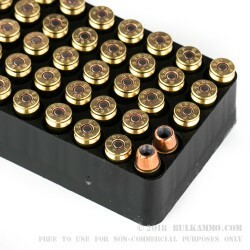 These .40 rounds are quick moving with a muzzle velocity of 1205 FPS and are designed to function reliably when you need it most—in a life or death situation. 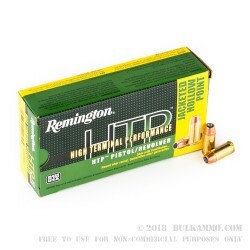 Each box of Remington High Terminal Performance .40 S&W ammunition comes with 50 rounds. For the last 200 years, Remington has upheld a tradition for manufacturing some of the world’s best firearms and ammunition. Beginning with their first rifle in 1816, all the way to today’s cutting-edge facility at “The Rock”, Remington continues to be at the forefront of firearms technology.